Looking at all regions within the Arctic Ocean it can be seen that an oscillation with a four year periodicity seems to emerge after 2000. The peaks can be seen better in a plot of post 2000 extent loss over August. The previous peaks are 2004, 2008, 2012, and now we have 2016. 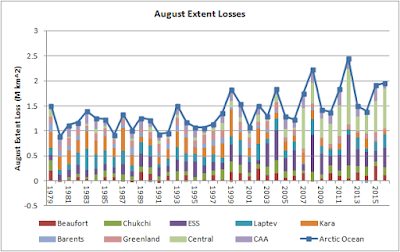 In 2016 August extent loss was similar to that in 2015. Amalgamating the above regions into three larger regions makes the pattern more clear. 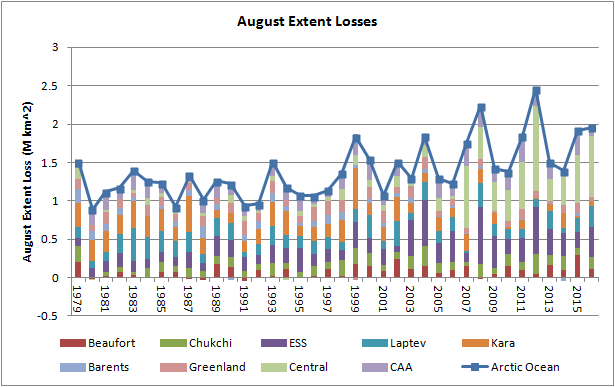 What happened this year was a failure of large losses in Chukchi and the East Siberian Sea (ESS). So what happened? 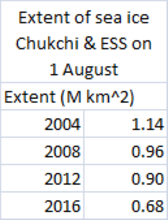 Looking at extent in Chukchi and the East Siberian Sea August started with lower extent than the other peak loss years. 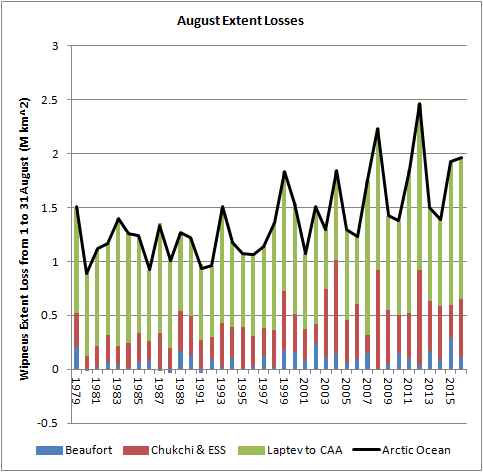 However, I've been away from this subject so haven't followed the weather, but August looked like a rather indifferent ice loss month from the point of view of the weather. So this may be a combination of both factors. 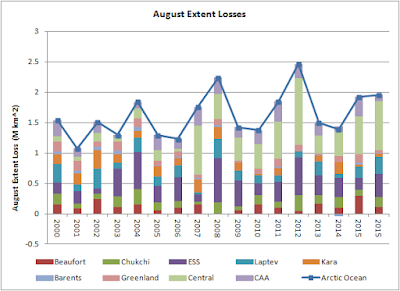 The test of whether there is a real cycle continues, next year should see a reduced extent loss in August, the following year should be rather lower before the next two years are higher. It would help if I could put forward a mechanism to test, but I still haven't figured that out. Chris, why is it that some people are so negative on the sea ice blog? It's almost like a doomer complex at times. Dreesen, I can't answer for Christ, but the reason some people appear to be negative at the Arctic Sea Ice Blog may be connected with the blogger being one of the most influential people within the sea ice community, and with Climate Change actually being still very much contested in the public sphere, and yet ice–blogger Neven declares ahead of season on his forum that "2016 could be a record-breaking year for the Arctic", but sums up the melt season by saying dishonestly that 2016 didn't break the record and was only 2nd lowest, when in actual fact it was lowest ever (and thus of course record–breaking, to use Neven's own words from the forum header). If he would just stick to the truth, much of this disagreement would vanish, is my guess. Not wanting to stick to the truth, conversely, controversy arises. That's a decent point, but 2016 was tied for second lowest extent according to the NSIDC. Let me make something crystal clear. Neven, you do great work and I mainly agree with your interpretations and viewpoints. However, some of the commenters on your blog are of the more "catastrophism" camp. People like Sam and Remko come to mind. Some of them also make wild projections that don't turn out to be true. I find you, John Christensen, and Chris Reynolds to be by far the most accurate people. The negative nancys are a distraction mainly, and not in a good way. I believe Neven himself said on his blog that Arctic sea ice wouldn't even be in the Top 3 lowest for minimum. That turned out not to be true, but it wasn't a "wild projection", Dreesen. It could have happened with different weather and with no global warming. He was also wrong the other day when he proclaimed 2016 was 2nd lowest for Arctic sea ice, as the data shows this year was lowest ever. Where are you getting that from? NSIDC doesn't show that. It seems even Arctic sea ice volume was lowest ever in 2016. Hear Peter Wadhams talk about that in this October 5th interview. Okay, Peter Wadhams is not the best source of information. He's been consistently wrong on ice-free predictions and has made some questionable claims on ch4 release. I think, philosophically, Arctic sea ice volume could still be lowest ever in 2016, even though the two of you are not the best of friends. Friendship in many ways and with all of its facets, is one thing, and meltdown of ice caps quite another. The one does not affect the other, if you get my drift. Philosophically perhaps. Even though I think Wadhams greatly exaggerates risks, the fact remains that it's better to hope for the best and plan for the worst. That's why I openly support more research into solar radiation management. Sorry for not replying all. I am deciding whether to mothball this blog as the time pressures of managing my departments and my own finances against the background of the disastrous Brexit events means I have no time for sea ice. I can't answer your question as I've hardly been over at Neven's blog. Chris, do you know if anyone other than you is providing the regional PIOMAS figures on a regular basis? To be frank I've not updated the data for some time as I get the impression nobody uses it. If you want me to start updating again I can probably fit that in. There is also Freezing degree days, I can't remember where I am with that but now Dr Slater has gone we could do with it. That would be a great help and highly appreciated, Chris. I've already had requests on my Sea Ice blog from readers who want more regional data and graphs, in particular for the CAB region, but I've no idea how to even start processing the gridded raw data from UW. Do you think you could possibly update the file 'Daily Regional Volume Breakdowns.csv' till September 2016 as well? It would really be of great help for my current research project.